It’s the second week of the One Room Challenge and I think this is the first time doing this challenge that I’m not already panicking. Although I should probably knock on wood because everything hasn’t been ordered/arrived yet. BUT the bed was delivered last week and that’s the main piece in the room. Ok, let’s talk progress and then I’m going to share my very detailed to buy/to do list for the room. The first step was to clear out the room. I gave the mattress and box spring to family and sold the bed frame set on OfferUp for $80. It was my first time selling on there and I had a really easy experience. Then Adam and I disassembled the desk and wrapped it up for storage. We moved everything else out of the room so we’d have plenty of space to assemble the new bed. 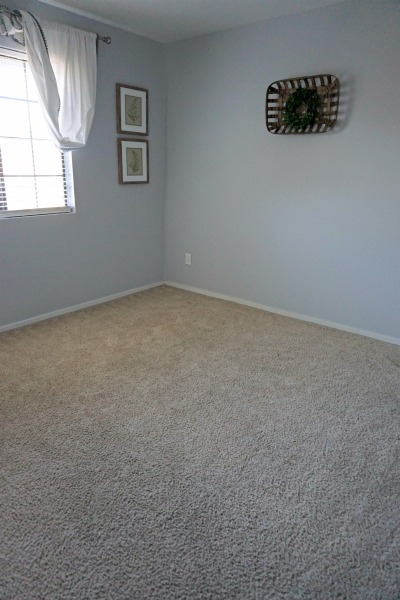 Oh, and we also thoroughly vacuumed and steam cleaned the carpet while the room was empty. Actually, I say “we” but Adam steam cleaned the carpet while I was at work a couple days ago…he’s pretty great. The new queen-size bedding arrived this week too. I ordered this striped duvet from Target in gray and in blue because I couldn’t decide and it was on sale at the time. I'll return whichever one I don’t use. I’ve loved this duvet cover ever since seeing it in one of Emily Henderson’s bedroom posts last year. I’m so excited to finally have a place to use it. 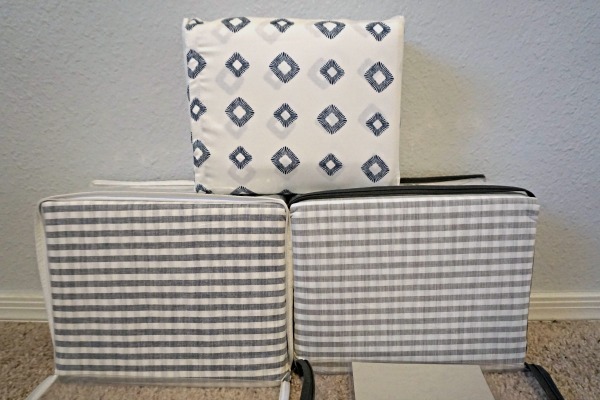 I also ordered the same sheets in her post because I love the combination of prints. The mattress is being delivered tomorrow, so I’ll be able to get the bed all made up this weekend! Now let’s talk to-do list. I know this list is really detailed, but I think it’ll help me stay on pace and finish the room in time. Usually I just lump items together and then I end up underestimating how much time I need to complete them or forget I need to order something for it until last minute. I’m sure I’ll think of other items to add as the challenge progresses. Don’t forget to check out the featured designers’ progress here and the other guest participants here. There’s so many great projects planned for this challenge and pretty much everyone room you can imagine is included! 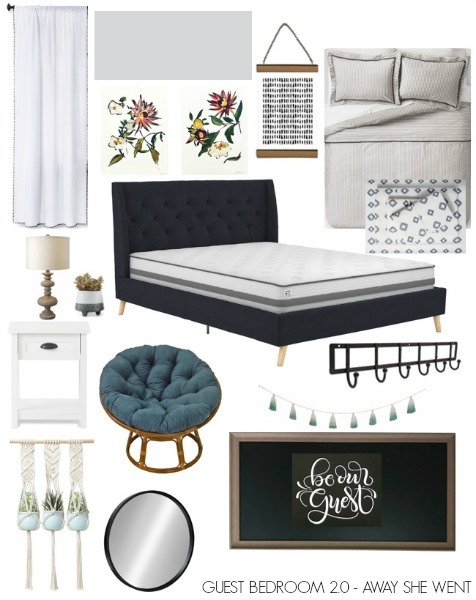 Also, my friend Meaghan is working on a nursery and I’m so excited to see how it turns out! Those plant holders got me like... 😍😍😍. I think I need some! I love this room! I love it. I can not wait to see that bed assembled, especially after the adorable insta story posts of your helpers yesterday. The plant holders are so cute and they are so cheap on Amazon! I'll have to text you a picture of the bed...it looks SO good! OMG!! that. bed. I cannot wait to see it in the room. It looks amazing! We put it together late last week and it looks SO good! I can't believe how good it looks for the price! I ended up picking the blue one, but I think the gray would have looked great too! Love the sheets and duvet you picked! I might have to check those out...our master has blues in it, so those are perfect. Can't wait to see the room come together! They are really nice quality and go on sale pretty often, so it's an affordable update!